Ray Crooke was born in Melbourne in 1922. His lifelong passion for nature developed as a boy and early on he entertained the idea of becoming a natural history illustrator. At 15 however he joined a Melbourne advertising agency and at night attended classes at Swinburne Technical College. The agency job ended with the outbreak of war and Crooke went on to study art full time at Swinburne before enlisting in the army. His service years saw him in Western Australia, North Queensland, Borneo and Thursday Island, places that would feature dramatically in his later work. After the war Crooke completed his art studies at Swinburne and held his first solo exhibition in 1948 at Melbourne’s Kosminsky Gallery. Crooke returned to Thursday Island in 1949 and worked as a trochus diver. In 1951 he married June Bethel and the couple settled in Cairns before moving back to Thursday Island where Crooke worked for the Anglican Diocese, an experience that was crucial to his subsequent development as a painter. The cool, Gauguin-like portrayal of island life that emerged in his work soon won him wide acclaim. Crooke returned to Melbourne in 1955 and in 1959 held a successful solo exhibition at Australian Galleries Melbourne. Now, highly sought after by major galleries, he returned to Cairns and with the picturesque Yorkey’s Knob as his base, travelled the tropics, the Gulf country, central Queensland, Fiji and Tahiti, creating some of the major pictures of his career. 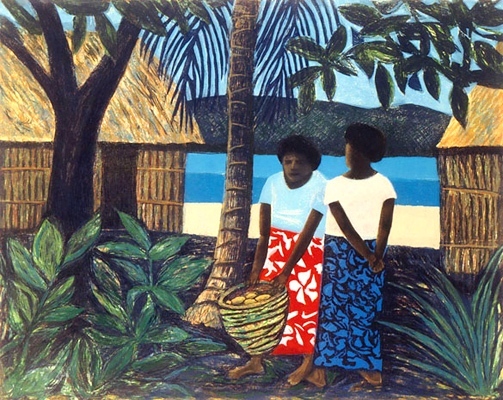 The experience of life in the tropics became a key element in his work. Ray Crooke’s work is in the National Gallery of Australia, all state and many regional galleries. His murals grace Australia House in London and his Painting “The offering” 1971, is in the Vatican Museum collection. Ray Crooke won the Archibald prize in 1969 with a portrait of his friend, the writer George Johnston. In 1993 he was made a member of the Order of Australia for services to the visual arts.